Laumas Elettronica S. R. L. comes from Italy, and its main products are load cells and weight transmitters. The products are mostly sold in Europe, Asia, North Africa, Middle East and other areas, and used by over 5,000 manufacturers. In the exhibition, Ivan Mielzarek, a principal of the company, said that before Laumas participated in InterWEIGHING, it used to be a visitor to this exhibition for three years in succession. They decided to participate after having an overall understanding of the exhibition. They realized that it was a superior international platform. 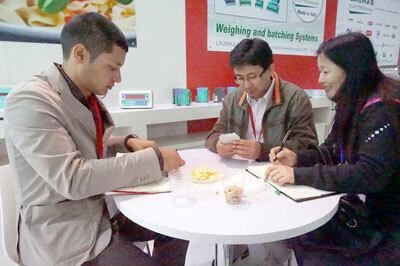 In 2009, they officially participated in InterWEIGHING, and rented two booths, which had wonderful results. No matter suppliers, customers or various academic conferences here were amazing. They came into contact with many new customers and suppliers in the exhibition, and could meet customers from all over the world every year. He used to participate in the exhibition of SPS/ IPC/ DRIVES in Nuremberg, Germany, but compared to that, InterWEIGHING is more professional. Ivan Mielzarek said, since 2009, Laumas was never absent in this exhibition in any year except the one in 2011 when they failed to come due to the flight cancellation arising from the Iceland volcanic eruption. This exhibition is of increasing importance to Laumas, and here he can meet customers and new and old friends from all over the world, especially those from developing countries including areas such as Latin America. When asked of the exhibiting effect this year, he was glad that it was a success, and the volume of transactions was expected to exceed ten million Euro. He also said that the new products of the company, TLB and W100, were sold well, and the company planned to continue expanding the market. Therefore, Laumas more favored this exhibition. Laumas’ strength can be known from its publicity brochures, because companies in cooperation with Laumas are all international well-known enterprises with strength.